My hair is getting longer and longer (YAY!!) and I wonder if perhaps I should start thinking about some cool hairstyle ideas... Yep, I should! 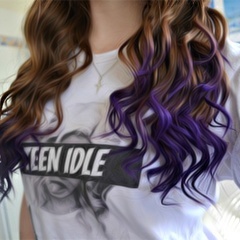 Purple is my fave colour, although I'm not sure I would be ok with a full purple-y head (but I do like when I see that on other people very much), I know for sure I'd love to have some purple tips.